The AfPak sessions led to an explosion of unauthorized disclosures, spin, and cutthroat bureaucratic gamesmanship, including the leak of the McChrystal Report to Bob Woodward of The Washington Post….The military, practiced in the ways of Washington, now ran PR circles around the neophytes in the Obama White House, leaking something to the Pentagon reporters nearly every day. The motive for all the leaks seemed clear to the White House: to box the president into the policy that McChrystal had recommended, at least another 80,000 troops and an open-ended commitment lasting 10 years or more. ….It was important to remind the brass who was in charge. Inside the National Security Council, advisers considered what happened next historic, a presidential dressing-down unlike any in the United States in more than half a century. In the first week of October, Gates and Mullen were summoned to the Oval Office, where the president told them that he was “exceedingly unhappy” with the Pentagon’s conduct. He said the leaks and positioning in advance of a decision were “disrespectful of the process” and “damaging to the men and women in uniform and to the country.” In a cold fury Obama said he wanted to know “here and now” if the Pentagon would be on board with any presidential decision and could faithfully implement it. “This was a cold and bracing meeting,” said an official in the room. Lyndon Johnson had never talked to Gen. William Westmoreland that way, or George H.W. Bush to Gen. Norman Schwarzkopf. Presidents Kennedy, Carter, and Clinton had all been played by the Pentagon at various points but hadn’t fought back as directly. Now Obama was sending an unmistakable message: don’t toy with me. Just because he was young, new, a Democrat, and had never been in uniform didn’t mean he was going to get backed into a corner. I’m not a fan of Obama’s escalation in Afghanistan, but this conversation makes me feel a little bit better about it. Only a little bit, though. 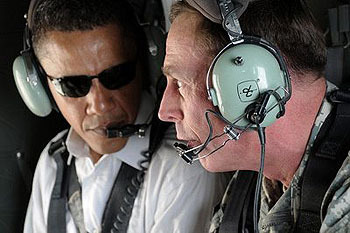 Promise or not, I’ll bet that next year, when the drawdown is supposed to start, Petraeus tells us we need to stay.